Moorpark Democratic Club | MCD was formed to support the election of Democrats. MCD was formed to support the election of Democrats. Join us at our next meeting on Thursday, September 13, doors open at 6:30pm; the meeting starts at 7pm. 6801 Breezy Glen Drive, Moorpark; to the left and before the gate. It will be a BBQ Potluck, Everyone brings a side dish to share, and a protein for themselves to BBQ. Our speaker will be Caleb and Lori Donnor. The topic will be: The US Supreme Court, the extremely significant role it plays in shaping the laws of our country/society, and how our individual rights and liberties might be impacted if Kavanaugh is confirmed. Also, discussion of how cases get to the US Supreme Court. So many people fail to realize just how much power the Supreme Court has over our rights whether it’s regarding health care, LGBTQ rights, contraception, abortion, civil rights, campaign finance reform, DACA, union rights, gerrymandering, etc. Each time these issues reach the Supreme Court, there is the potential for rights to be expanded or whittled away. Sadly, the Supreme Court has become more politically polarized and it’s extreme conservative leaning may damage our country for decades to come. We also meet every Friday morning at 9:30am at the Moorpark Country Club, 11800 Championship Drive, Moorpark for breakfast and conversation. Ten to 15 of us gather to discuss the weeks events and current fustration. Please join us if you can. Also we are having a fundraiser for three of our members who are running for office on Sept 15. 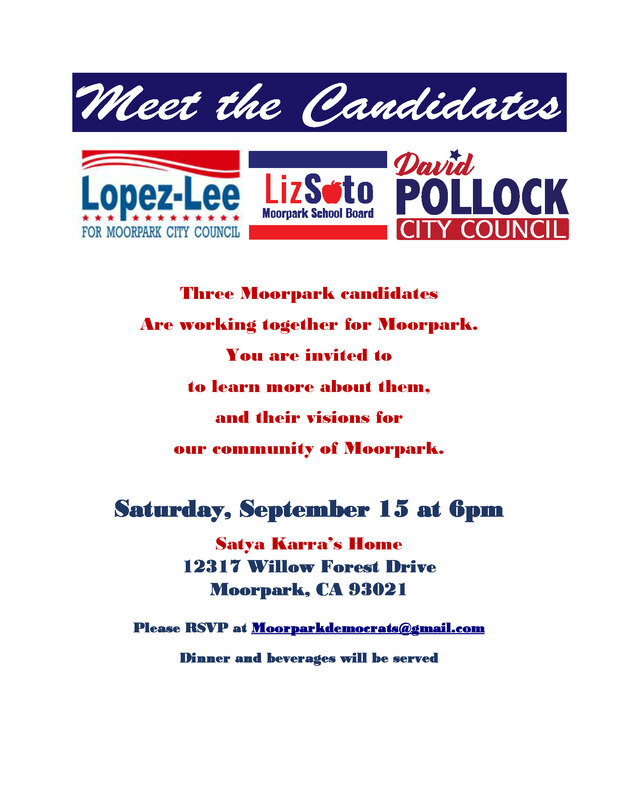 RSVP at moorparkdemocrats@gmail.com The flyer is below.